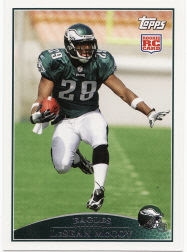 The rookies are in great supply and a guaranteed jersey or autograph hit helps, but the best part of 2009 Topps Football are the “Football Stars” cards. They have the look of cards that were made 54 years ago! For right around $50 the value is built in and the rookies are the real draw here since the odds on pulling a patch or dual auto are very high. I did managae to get a lot . . . .